user warning: Table 'drupalgastronomer.comments' doesn't exist query: SELECT COUNT(*) FROM comments c WHERE c.nid = 166 AND c.status = 0 in /home/dgabriner/gourmetgastronomer.com/modules/comment/comment.module on line 992.
user warning: Table 'drupalgastronomer.comments' doesn't exist query: SELECT c.cid as cid, c.pid, c.nid, c.subject, c.comment, c.format, c.timestamp, c.name, c.mail, c.homepage, u.uid, u.name AS registered_name, u.signature, u.picture, u.data, c.thread, c.status FROM comments c INNER JOIN users u ON c.uid = u.uid WHERE c.nid = 166 AND c.status = 0 ORDER BY c.thread DESC LIMIT 0, 50 in /home/dgabriner/gourmetgastronomer.com/modules/comment/comment.module on line 992. 2 thick cut slices bacon or pancetta (go to your butcher counter. They can usually slice them thick for you, which taste better in the pasta and means you only have to buy two or three slices, if you don't have bacon on the reg). (I quartered this recipe, which made two hearty portions). Mound the flour in the center of a large wooden cutting board. Make a well in the middle of the flour, add the egg(s). Using a fork, beat together the eggs and begin to incorporate the flour starting with the inner rim of the well. As you incorporate the eggs, keep pushing the flour up to retain the well shape (do not worry if it doesn't look pretty, or if, like me, your egg leaks out. Just chase it and reincorporate). The dough will come together in a shaggy mass when about half of the flour is incorporated. Start kneading the dough using the palms of your hands. Add more flour, in increments, if the dough is too sticky. Once the dough is a cohesive mass, remove the dough from the board and scrape up any left over dry bits. Lightly flour the board and continue kneading for 3 more minutes. The dough should be elastic and a little sticky. Continue to knead for another 3 minutes, dusting your board when needed. Wrap the dough in plastic wrap and set aside for 20 minutes at room temperature. 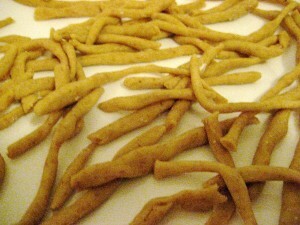 Note: Do not skip the kneading or resting portion of this recipe, they are essential for a light pasta. Remove bacon from fridge (if it is too warm it is hard to cut. Stick it in the freezer for a few minutes). Slice into 1/8 inch lardons by setting the bacon horizontally on the board, and cutting little sticks all the way down the length of the bacon slice. You should have 15 maybe? Perhaps fewer. Repeat with second slice. Peel and finely chop your garlic. Wash your raab well, then cut the stems off. Since we are in a waste not, want not type period these days, I like to chop the stems up small and use them too. You can make that call. I tend to chop the bunch leaves only once or twice, as they cook down and I like significant greens. Set a medium to large sautee pan over medium heat, add 1 tbs of olive oil, and the bacon. A minute or two after, add the stems, if using. Let the bacon render out and get crispy, or to desired crispiness. Somewhere about now, add chili flakes. 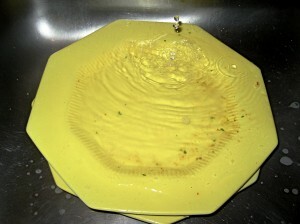 SET WATER TO BOIL (or do this as you start rolling, if you have a big batch of dough. Enlist friends for rolling if so). When it hits a boil, add a GOOD BIT of salt. The water should taste salty. Back to the bacon. Check how much fat renders off. If it's a ton, you can drain some. Mine wasn't that much, so I just skipped the second tbs olive oil. Add garlic and toss around until fragrant, then add greens. Let greens cook down a bit, then turn off heat (unless you are very talented, or have a sous chef, in which case they can be rolling pasta while you do sauce). 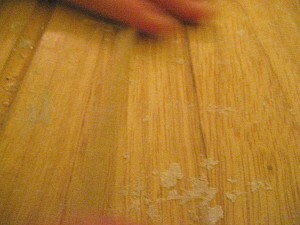 Roll out the dough (on a dusted board, if needed) and cut into thin strips. Roll each of these out in play-dough like ropes, and cut or tear to desired lengths. Think thin, they will fatten up like-whoa. Try to do this right before you are ready to cook the pasta. Toss the pasta into the pot. Cooking time will vary depending on your rolling. Check it after a few minutes, especially if thin, by cutting it open and looking to see if center is still doughy. I finished my pasta in the pan, so leave a little leeway here. Turn the sauce again to medium heat, and toss around. 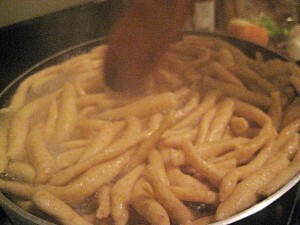 When finished, drain pasta, reserving 1 cup of pasta water, and toss pasta into pan. 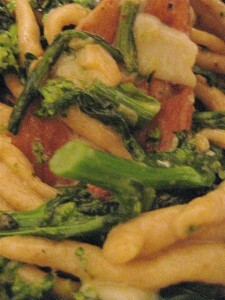 Cook for 2-3 minutes, adding water as needed, to crisp the pasta and create a bit of sauce. When finished, put into serving bowl, then crack the egg on top. Mix quickly and well to distribute, then add parm. Mix well, serve immediately, laugh over dinner, and try to avoid tossing a full glass of wine across the living room (it happens to the best of us).